On Monday 14th January we invited the whole salon group to Ashbourne for our annual meeting and awards presentation. 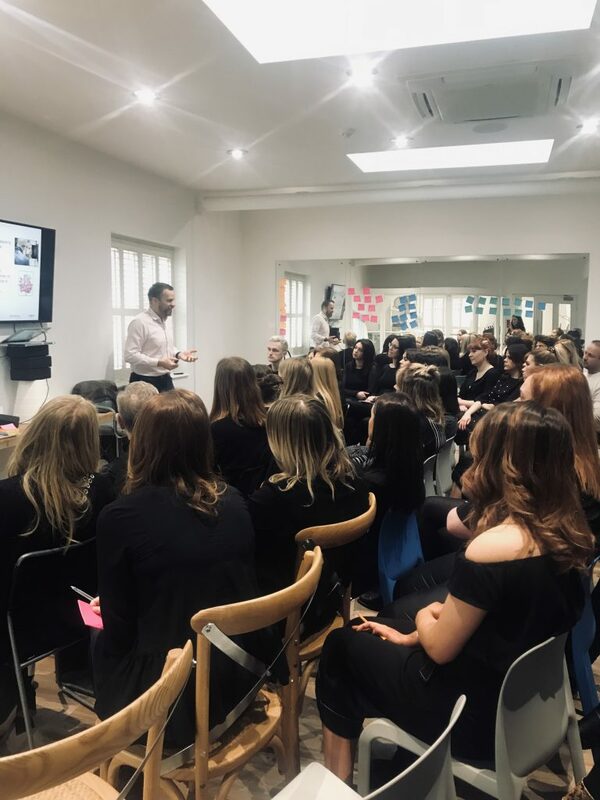 We kicked off with an incredibly motivational session with Paul Fishwick, Commercial Development Manager at L’Oreal Professionnel, who inspired us with a workshop on customer excellence and the five star experience. We moved on to a presentation by Sally who reviewed everything that our business and team had achieved in 2018 while looking ahead to what is in store for the next year. Next, the awards presentations highlighted the team members who had excelled in 2018. Competition is very tough and we only have eight categories so all of the winners and nominees should be incredibly proud. Congratulations to the entire team for making 2018 so fantastic! The apprentice award for fantastic future potential was awarded to Kaylah – Congratulations Kaylah and well done to our entire apprentice team! Next up was the best newcomer award which was presented to Sarah- Sarah has made a fantastic start and works in the booking office in Ashbourne. Congratulations Jade, Jade won our spa therapist growth award for 2018. Jade works at both our Ashbourne and Belper salons and in the last year has completed training in ESPA, HD Brows, CACI, WAXU and CARITA. The five star service award was presented to Emily and Zoe. Thank you to everyone who sent their feedback to help decide who should win this award . Emily is a senior stylist at Belper and Montague Creative at Derby University and Zoe is a creative director at Duffield and Belper. Trying to squeeze everyone in was a challenge but congratulations to the Old Hall salon who won the team spirit award – well done! 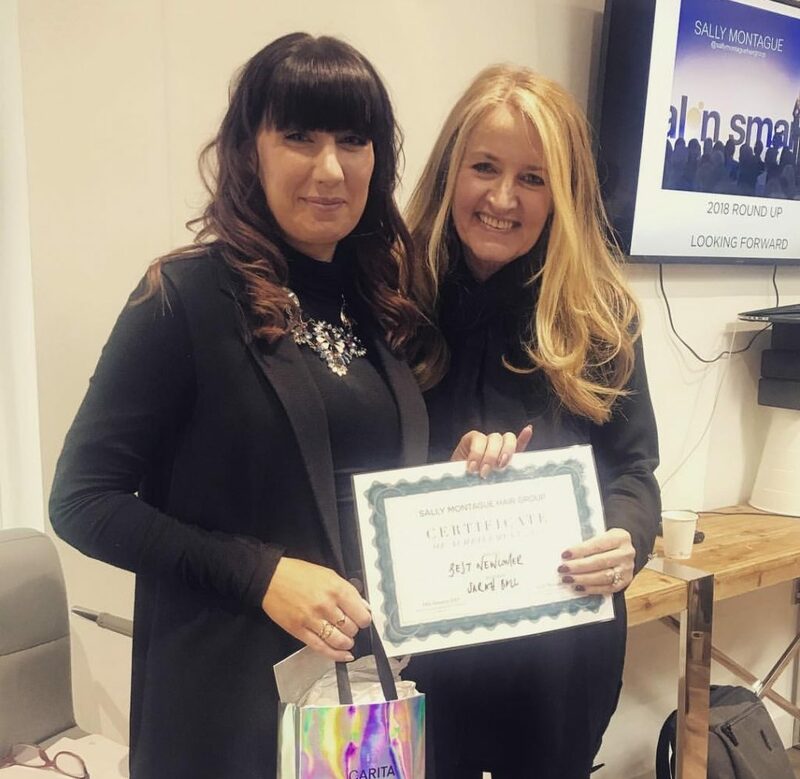 Well done to Lizzie for taking home the ‘Best Performed Stylist’ award. Lizzie is the salon manager at Sadler Gate and this award is very much deserved, 8th year and counting! Congratulations to the Ashbourne team who scooped the 2018 Salon of the Year! This entry was posted in ASHBOURNE, AWARDS, BELPER, Competition, Duffield, EVENT, PRESS, Uncategorised on 26th January 2019 by emmanuelle. This entry was posted in ASHBOURNE, BACKSTAGE, BEAUTY, BELPER, Cloud Nine, COLORED HAIR, Duffield, Editorial, ESPA, EVENT, FASHION WEEK, INSPIRATION, KERASTASE, L'OREAL PROFESSIONNEL, MEN, PRESS, PROMOTION, Shu Uemura Art of Hair, SPA, studio on 4th January 2019 by emmanuelle. Last week we were delighted to welcome the young Derbyshire athletes who have been selected to compete at the Commonwealth Games next month on the Gold Coast. The athletes, their mums and team members from the Derbyshire Institute of Sport all enjoyed hair and make up appointments in preparation of their celebratory dinner at Seven restaurant on Pride Park. Our stylists were on hand for blow dries while Leanne (Spa Therapist at Ashbourne) used Airbase make up to give the athletes a flawless make up application. Airbase is applied using a spray gun and offers a light application with a long lasting and full coverage. It’s ideal for special occasions and so we knew it would be ideal to use for the athletes who were being interviewed on TV that evening. The Derbyshire Institute of Sport was inspired by the London Olympic Games and was launched in 2012 as Derbyshire’s legacy programme. Although Derbyshire had produced champions in the past, their aim is to create a systematic model, leaving less to chance, and giving athletes the best possible chance of achieving their Olympic dream. You can find out more about the Derbyshire Institute of Sport here. This entry was posted in ADVICE, BEAUTY, EVENT, INSPIRATION, PRESS, SPA on 2nd March 2018 by emmanuelle. Cloud Nine teamed up with hair industry bible Creative HEAD magazine for a Christmas cover shoot with Angel taking the lead backstage on a collection of eight cool, easy going looks. Cloud Nine electrical tools are available in each of our salons and we offer a complimentary styling lesson with all tools purchased. This entry was posted in ADVICE, Angel, Cloud Nine, Editorial, PRESS on 7th December 2017 by emmanuelle. We’ve been celebrating after being named one of just five finalists in the Best Local Salon category of national hairdressing competition – the Most Wanted Awards. Thanks to an impressive display of skill, dedication and talent, Sally Montague Hair Group beat off stiff nationwide competition to secure a place at the Most Wanted Grand Final on Monday 4th September 2017, taking place at the historic London Guildhall and hosted by comedian Katherine Ryan. The salon submitted an entry based on their commitment to their clients and the community, showcasing collaboration with other businesses and the continual training and progression of their team. Judged by influential names in hair, fashion, business and the media – including Vogue beauty editor Lauren Murdoch-Smith, and the founders of BeautyMART, Millie Kendall MBE and Anna-Marie Solowij – the Most Wanted Awards celebrate the outstanding individuals, teams and salons that make British hairdressing the best in the world. This entry was posted in AWARDS, PRESS on 2nd September 2017 by emmanuelle. This entry was posted in Angel, Editorial, INSPIRATION, PRESS, SM(ART) TEAM, Uncategorised on 5th October 2016 by emmanuelle. We are incredibly excited to be the only salon in Derbyshire taking part in Vogue’s Salon Season, a month-long celebration of modern, professional hair treatments and styling in association with Kérastase. Vogue’s beauty director, Nicola Moulton, has presented an edit of four modern hair looks that can be tailor-made to suit the condition of your hair. Simply book a Vogue blow-dry at any of our salons from now until the end of October and you will receive a complimentary Fusio Dose reconditioning ritual, usually priced £15. Appointments are with selected stylists across the salon group and are available Monday to Saturday, subject to availability. If you are booking online, please select ‘extension blow-dry’. If you are booking by phone just book a Vogue blow dry and your stylist will help choose the right ritual and style for you. More details can be found in the October edition of Vogue. A sleek, glossy blow-dry with dazzling, mirror-like shine, the secret to this look is that the healthier your hair is, the more light it can reflect. The gently curled-under ends keep things modern and not too poker-straight. Gentle, luxe-looking waves combined with glossy, freshly rejuvenated colour are the key to ensuring natural movement stays sophisticated. Note the gleam in every undulating wave. Your stylist will personalise a modern updo especially for you. Choose a sleek, structural chignon, plait or a ponytail. The radiant elixir shine will make this style stand out. The “no blow-dry” blow-dry: so subtle and understated, it just looks like you’ve woken up like that. Minimal root lift, sleek through the middle with naturally tumbling ends. When you book a Vogue blow dry you will receive a bespoke Fusio Dose ritual, usually priced £15. This entry was posted in ADVICE, BACKSTAGE, KERASTASE, PRESS, PROMOTION and tagged Kerastase, Vogue, Vogue Salon Season on 29th September 2016 by emmanuelle. We had a busy time at the L’Oreal Professionnel HAIR FASHION NIGHT earlier this month. Our stylists were on hand at Duffield to help guests choose from six looks to try at the event which took place at selected salons all over the world. We had visits from beauty bloggers who tried several different looks including the ‘Flave’ and ‘French Hair’ with the emphasis on learning tips and tricks on how to style hair differently at home. This entry was posted in ADVICE, BACKSTAGE, Duffield, FASHION WEEK, INSPIRATION, L'OREAL PROFESSIONNEL, PRESS on 30th May 2016 by emmanuelle. On Tuesday 17th May 2016 an afternoon and evening of celebration ensued as staff from the Sally Montague Hair Group’s six salons in Derbyshire gathered at the historic Cathedral Quarter Hotel in Derby for its annual awards ceremony. Held to coincide with the 33rd anniversary of Sally Montague Hair Group, the highly anticipated awards aims to identify the salon stars that have excelled in their roles over the last 12 months. The 13 categories including The L’Oréal Professionnel Colour Genius and Best Salon Team, ensured members of staff were recognised and rewarded on the night. Director Sally Montague presented the trophies and prizes, which ranged from an vouchers to luxury hair and skin care. The afternoon began with a presentation outlining the group’s achievements throughout 2015 and this year’s plans for the business including the new salon and spa being built in Ashbourne. Sally then presented the prizes in the awards ceremony to the evening’s winners and the night culminated with a celebratory dinner, where staff toasted their collective successes and awards. All salon teams clubbed together to present Sally Montague with flowers and a present to celebrate the 33rd anniversary of the business. This entry was posted in AWARDS, BELPER, Colour Specialist, Duffield, Education, INSPIRATION, L'OREAL PROFESSIONNEL, PRESS, SM(ART) TEAM on 25th May 2016 by emmanuelle. 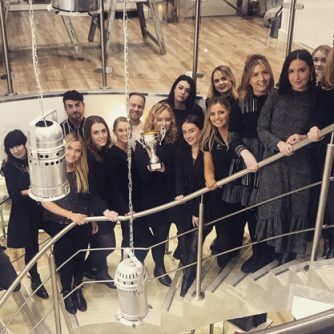 We were delighted to have a record breaking five teams in the regional heat of this years L’Oreal Colour Trophy. 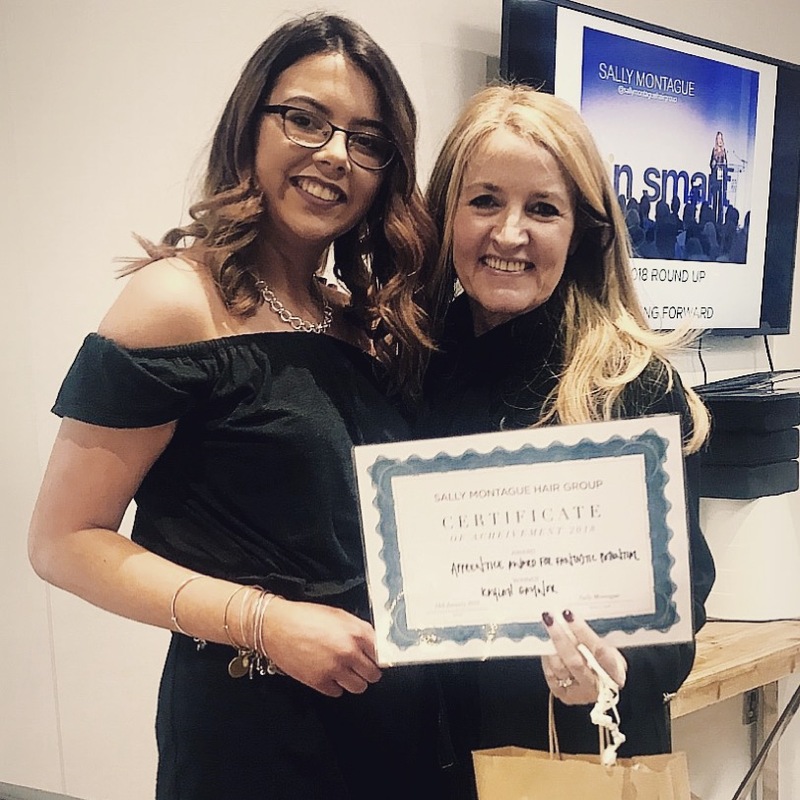 Stylists from our Ashbourne, Duffield, Sadler Gate and Belper salons all competed at the event in Manchester to win a place in the Grand Final against other salons from across the region. 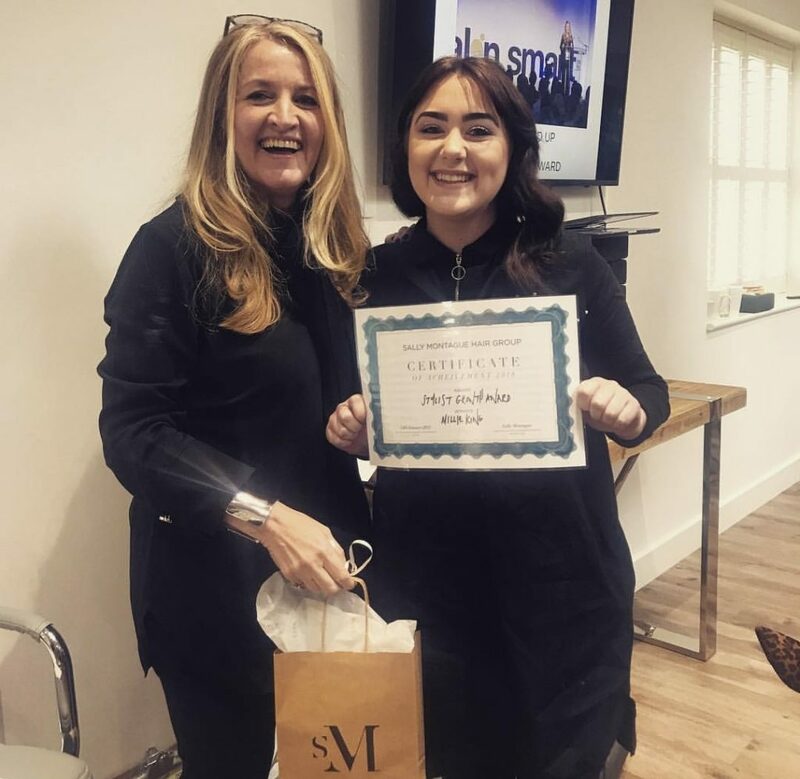 Our teams from across the group went to watch and be a part of the event and were delighted when Imogen Coates from the Duffield salon won her category in the Rising Star Award. With her place in the team firmly secured, Imogen will now compete at the L’Oréal Colour Trophy Grand Final which takes place on Monday 13th June, 2016 against the other ‘STAR’ award winners to win ‘judges favourite’ and the amazing prize of an exclusive European photo-shoot. The Grand Final show promises a thrilling and inspirational black-tie event featuring spectacular hair shows by some of the industry’s most illustrious names in hairdressing followed by a 5 course dinner and the much celebrated awards presentation ceremony. Over 3 weeks in April the L’Oréal Colour Trophy Backstage tour has visited nine cities and identified nine exceptional young hairdressers as STAR award winners from across the country who will now form the L’Oréal Professionnel Colour Academy 2016. To make an appointment with Imogen please call 01332 843 000. This entry was posted in AWARDS, BACKSTAGE, Duffield, ID ARTIST, INSPIRATION, L'OREAL PROFESSIONNEL, PRESS, SM(ART) TEAM and tagged #LCT16, Lorealcolourtrophy on 23rd April 2016 by emmanuelle.